Lipoxins and 15-epi-lipoxins are counter-regulatory lipid mediators that modulate leukocyte trafficking and promote the resolution of inflammation. To assess the potential of lipoxins as novel anti-inflammatory agents, a stable 15-epi-lipoxin A4 analog, 15-epi-16-p-fluorophenoxy-lipoxin A4 methyl ester (ATLa), was synthesized by total organic synthesis and examined for efficacy relative to a potent leukotriene B4 (LTB4) receptor antagonist (LTB4R-Ant) and the clinically used topical glucocorticoid methylprednisolone aceponate. In vitro, ATLa was 100-fold more potent than LTB4R-Ant for inhibiting neutrophil chemotaxis and trans-epithelial cell migration induced by fMLP, but was ∼10-fold less potent than the LTB4R-Ant in blocking responses to LTB4. A broad panel of cutaneous inflammation models that display pathological aspects of psoriasis, atopic dermatitis, and allergic contact dermatitis was used to directly compare the topical efficacy of ATLa with that of LTB4R-Ant and methylprednisolone aceponate. ATLa was efficacious in all models tested: LTB4/Iloprost-, calcium ionophore-, croton oil-, and mezerein-induced inflammation and trimellitic anhydride-induced allergic delayed-type hypersensitivity. ATLa was efficacious in mouse and guinea pig skin inflammation models, exhibiting dose-dependent effects on edema, neutrophil or eosinophil infiltration, and epidermal hyperproliferation. We conclude that the LXA4 and aspirin-triggered LXA4 pathways play key anti-inflammatory roles in vivo. Moreover, these results suggest that ATLa and related LXA4 analogs may have broad therapeutic potential in inflammatory disorders and could provide an alternative to corticosteroids in certain clinical settings. Lipoxin A4 (LXA4)3 is a short-lived, tetraene eicosanoid with potent anti-inflammatory activities (Ref. 1 and references therein). LXA4 is produced locally at sites of inflammation by transcellular biosynthesis via interaction of neutrophils with platelets or other leukocytes with epithelial cells. Endogenous LXA4 synthesis in neutrophils is primed by cytokines (2) and elevated in neutrophils from asthmatic subjects (3, 4, 5). LXA4 may exert its anti-inflammatory effects through signals generated by binding to a high affinity, G protein-coupled LXA4 receptor, ALX-R (1). ALX-R is conserved in mammals; it is constitutively expressed on neutrophils, eosinophils, and monocytes and is induced on epithelium and vascular endothelium, thus being ideally localized to effect a counter-regulatory role in promoting the resolution of cell-mediated inflammatory responses. ALX-R expression on neutrophils and eosinophils correlates with the ability of lipoxins to potently inhibit chemotaxis and transcellular migration of these cells. Aspirin triggers 15-epi-LXA4 formation both in vitro and in vivo via a mechanism involving cyclooxygenase-2 inhibition (6). Aspirin-triggered 15-epi-lipoxins (ATLs) retain the anti-inflammatory properties of LXA4 and may mediate in part aspirin’s therapeutic effects (7). LXA4 and ATLs undergo rapid metabolic inactivation by PG dehydrogenase-mediated oxidation and reduction (8, 9). These metabolites have reduced affinity for ALX-R and decreased anti-inflammatory potency. Chemical modifications to the C15-C20 region of LXA4 and ATLs prevent metabolic inactivation, thus providing stable analogs with superior pharmaceutical characteristics (10). The stable lipoxin analogs inhibit neutrophil transcellular migration, pathogen- and TNF-α-induced epithelial cell IL-8 release, and vascular permeability of mouse ear skin exposed to inflammatory stimuli (Ref. 1 and references therein). In TNF-α-induced dorsal air pouch inflammation, stable LXA4 analogs have potent local and systemic anti-inflammatory efficacy via down-regulation of proinflammatory cytokine and chemokine networks (11, 12). More specifically, lipoxins inhibit cytokine-stimulated IL-1β, macrophage inflammatory protein-2, and superoxide production while stimulating the anti-inflammatory cytokine IL-4 in neutrophils (11). Eosinophil-driven allergic reactions are also inhibited by stable LXA4 analogs (13, 14). Lipoxins inhibit eosinophil chemotaxis, and IL-5 and eotaxin secretion (13). Moreover, lipoxins inhibit mesangial cell proliferation (15). Finally, lipoxins have been shown to inhibit the transcription factor NF-κB, which is a central regulator of inflammatory molecules and also is pivotal for proliferation and anti-apoptosis (16). Thus, an anti-proliferative effect can add to the anti-inflammatory mechanisms of lipoxins that interfere with the activation and migration of inflammatory cells. Results to date suggest that the LXA4/ALX-R pathway promotes counter-regulatory signals to diverse proinflammatory mediators and that stable LXA4 analogs may have therapeutic potential in inflammatory and autoimmune disease. Because of the limited amounts of synthetic LXA4 analogs available, a role for LXA4/ALX-R in regulating cutaneous inflammation has not been studied systematically, and there is limited information on the efficacy profile of LXA4 analogs in industry standard animal models that represent distinct mechanisms of clinically relevant cutaneous inflammation. Quantitative results comparing the potency and efficacy of a stable LXA4 analog to other anti-inflammatory agents, including clinically relevant standards, such as glucocorticoids, is also lacking. To address these points, the topical efficacy of a stable ATL analog synthesized in bulk, namely 15-epi-16-p-fluorophenoxy-lipoxin A4 methyl ester (ATLa; Fig. 1⇓), was tested in a variety of skin inflammation models. The models were chosen to evaluate potential utility in distinct dermatoses, since they exhibit pathological features found in irritant contact dermatitis, psoriasis, allergic contact dermatitis, urticaria, and atopic dermatitis. Anti-inflammatory potency and efficacy were compared with those of a leukotriene B4 (LTB4) receptor antagonist (LTB4-R-Ant) and methylprednisolone aceponate (MPA), a mid-potent glucocorticoid that is marketed in Europe and frequently used for topical treatment of atopic dermatitis in children. The present results indicate that ATLa displays broad topical efficacy in all models of skin inflammation examined and proved to be dose-dependent for inhibiting edema, leukocyte infiltration, and epidermal hyperproliferation. ATLa gives a unique anti-inflammatory profile, suggesting potential use in topical treatment of dermatoses. The figure shows the structure of ATLa, which is a metabolically stable analog of aspirin-triggered 15-epi-LXA4. The stable analog ATLa (Fig. 1⇑) was synthesized using previously described methods (17). Material of >95% purity was qualified against a synthetic ATLa standard (provided by Dr. N. Petasis (University of Southern California, Los Angeles, CA) and Dr. C. N. Serhan (Brigham and Woman’s Hospital, Harvard University, Boston, MA)) using 1H nuclear magnetic resonance, HPLC coinjection with photodiode array UV-visible detection (two methods), and liquid chromatography-mass spectrometry. The LTB4 receptor antagonist ZK-158252 (18, 19) (LTB4R-Ant), Iloprost, and LTB4 for in vivo studies were synthesized at Schering AG (Berlin, Germany). LTB4 for in vitro studies was purchased from Cayman (Ann Arbor, MI). Hexadecyltrimethylammonium bromide (HTAB), fMLP, calcium ionophore A-23187, croton oil, mezerein, and trimellitic anhydride were obtained from Sigma (St. Louis, MO). Neutrophils from healthy volunteers were obtained as previously described (10) and suspended in RPMI 1640 (BioWhittaker, Walkersville, MD) at 1 × 106 cells/ml. FMLP (10 nM), 10 nM LTB4, or vehicle was added to the lower wells of a 48-well, 5-μm pore size chemotaxis chamber (NeuroProbe, Cabin John, MD). Neutrophils (50 μl) were placed in the upper wells, and the chamber was incubated (37°C, 5% CO2) for 1 h. Following incubation, filters were removed, and cells were scraped from the upper surface. The filters were fixed and stained with Diff-Quik (Dade Behring, Newark, DE). For each incubation, performed in triplicate, cells that migrated across the filter toward the lower surface were enumerated by light microscopy. To assess inhibition of migration, neutrophils were suspended in RPMI medium with vehicle or increasing concentrations of the compounds (ATLa or LTB4R-Ant) and incubated for 30 min at 37°C before placement in the chamber. Human neutrophil transmigration across confluent monolayers of human T84 epithelial cells was performed as previoulsy described (10). All animal studies were approved by the competent authority for labor protection, occupational health, and technical safety for the state and city of Berlin, Germany, and were performed in accordance with the ethical guidelines of Schering. Female NMRI mice (26–28 g) or pirbright white guinea pigs (Charles River, Wilmington, MA; 200–250 g) were housed according to institutional guidelines of the Schering animal facility. NMRI mice are outbred Swiss mice from Lynch to Poiley (National Institutes of Health, Bethesda, MD; albino, Aa, BB, cc, DD, histocompatibility H-2q). Eight to 11 animals were randomly allocated to the different treatment groups. Because of the acute character of the models, ATLa, LTB4R-Ant, or MPA was applied topically at the same time as the elicitation of the inflammatory reaction. Tissue weight (ears or dorsal skin punch biopsies) served as a criterion for edema formation. Peroxidase activity in skin homogenates served as a measure of total granulocyte (neutrophil and eosinophil) infiltration, and elastase activity served as a specific measure of neutrophil infiltration. The stable PGI2 analog Iloprost enhances LTB4-induced ear inflammation, leading to edema and a neutrophilic infiltrate with a maximum reaction 24 h after elicitation (20). Ten microliters of 0.003% (w/v) LTB4 and 0.003% (w/v) Iloprost in ethanol/isopropylmyristate (95/5), with or without the respective anti-inflammatory agent, were applied dorsally to mouse ears. Animals were euthanized with CO2 24 h after application. Ears were cut off, weighed as an indicator for edema formation, and snap-frozen. Ears (area, ∼1 cm2) were homogenized in 2 ml of buffer containing 0.5% HTAB and 10 mM MOPS (pH 7.0) in a Polytron(R) PT 3000 homogenizer (KINEMATICA, Lucerne, Switzerland) set at maximum speed (30,000 rpm). Samples were centrifuged, and 750 μl of supernatants were transferred to 96-deep-well plates (Beckman, Palo Alto, CA). The supernatants were then used to determine peroxidase and elastase activity as a measure for infiltrating granulocytes (peroxidase) and neutrophils (elastase), as described below. Anti-inflammatory effects of a given compound were defined as the percent inhibition of edema formation and peroxidase and elastase activities. The calcium ionophore A-23187, applied topically, induces acute inflammation with edema and granulocyte infiltration that peaks at ∼24 h (21). Ten microliters of a 0.1% (w/v) solution of A-23187 in ethanol/isopropylmyristate (95/5), with or without the respective anti-inflammatory agent, were applied dorsally to mouse ears. Animals were euthanized 24 h later, and the ears were processed as described for the LTB4/Iloprost inflammation model. The nonspecific contact irritant croton oil leads to acute inflammation and is characterized by edema formation and a mainly granulocytic cell infiltration into the skin (22). Ten microliters of 1% (v/v) croton oil in ethanol/isopropylmyristate (95/5), with or without the respective anti-inflammatory agent, were applied dorsally to mouse ears. Animals were euthanized at 24 h, and ears were processed as described for the LTB4/Iloprost inflammation model. Mezerein causes acute inflammation, with edema formation and granulocyte infiltration within 24 h and epidermal hyperproliferation within ∼72 h (23). Ten microliters of 0.03% (w/v) mezerein in ethanol/isopropylmyristate (95/5) with or without the respective anti-inflammatory agent were applied dorsally to mouse ears. For inflammation end points, animals were euthanized at 24 h, and ears were processed as described for the LTB4/Iloprost inflammation model. As an indication for hyperproliferation, epidermal thickness was determined morphometrically in Formalin-fixed, plastic-embedded, sectioned, and toluidine blue-stained specimens obtained from the ears of mice euthanized at 72 h.
Sensitization with the occupational contact allergen trimellitic anhydride (TMA) induces a DTH reaction, with prominent eosinophil infiltration 24 h after challenge (24), which, in contrast to other types of acute contact dermatitis, is characterized by a mixed Th1/Th2 reaction. Mice were sensitized on days 0 and 1 by a single application of 50 μl of 3% (w/v) TMA in acetone/isopropylmyristate (80/20) onto a shaven area of 2 × 2 cm on the right flank. The DTH reaction was induced on day 5 by challenging the animals with a single application of 10 μl of 3% (w/v) TMA in acetone/isopropylmyristate (80/20) with or without the respective anti-inflammatory substance onto the dorsal sides of both ears. Animals were euthanized 24 h after challenge, and ears were processed as described for the LTB4/Iloprost inflammation model. Peroxidase activity as a measure of total granulocyte infiltration was measured as previously described (25). Briefly, tetramethylbenzidine (TMB) dihydrochloride was used as a sensitive chromogen substrate for peroxidase. To convert TMB into TMB dihydrochloride, 34 μl of 3.7% hydrochloric acid (equimolar) was added to 5 mg of TMB. Then 1 ml of DMSO was added. This stock solution was slowly added to sodium acetate-citric acid buffer (0.1 mol/L, pH 6.0) in a ratio of 1:100. Two hundred microliters of this TMB solution, 40 μl of the homogenized sample, and 25 μl of 1 mM H2O2 were added to a microtiter plate to start the reaction. The reaction was stopped after 30 min with 45 μl of 1 N H2SO4. Changes in OD were monitored at 450 nm at 25°C against the mixture of all solutions without the added sample homogenate. Absolute extinction numbers were used to express peroxidase activity. Elastase activity was measured by fluorescence of 7-amino-4-methyl-coumarin (AMC) that is released from the substrate MeO-Succ-Ala-Ala-Pro-Val-AMC (Bachem, Torrance, CA). Homogenized samples in HTAB were diluted 1/10 in cetrimide buffer (0.3% cetrimide, 0.1 M Tris, and 1 M NaCl, pH 8.5). The substrate MeO-Succ-Ala-Ala-Pro-Val-AMC (300 mM in DMSO) was diluted 1/100 in cetrimide buffer to a working concentration of 3 mM. In cetrimide buffer, diluted samples were pipetted in multiwell plates, and the reaction was started by addition of the AMC substrate at 37°C. The reaction was stopped after 1 h with ice-cold 100 mM Na2CO3, and samples were measured in a Spectra Max Gemine (Molecular Devices, Menlo Park, CA) at 380 nm and compared against a standard curve with the AMC standard 7-amino-4-methylcoumarin (5 mM in ethanol). For all animal models statistical analysis was performed with the so-called modified Hemm (inhibition) test, which was developed by Schering’s Department of Biometrics based on the program SAS System for Windows 6.12 (SAS Institute, Cary, NC). To determine the inhibitory effect of anti-inflammatory compounds, the difference between the respective mean value of the positive controls and the mean value of the vehicle controls was set at 100%, and the percentile change by the test substance was estimated: % change = [(mean valuetreated group − mean valuepositive group)/(mean valuepositive group − mean valuecontrol group)] × 100. To test whether the change caused by the treatment is different from zero, a 95% confidence interval was calculated under consideration of the variance of observations within the entire experiment. If the interval did not include zero, the hypothesis that there is no change was rejected at the level of α = 0.05. For each experiment IC50 values were determined graphically. A hallmark of inflammation is the movement of circulating leukocytes into tissues via chemotaxis and transcellular migration across endothelial and epithelial cell barriers (26). Classical chemotactic mediators include the bacterially derived N-formylated peptide, fMLP, and the proinflammatory eicosanoid, LTB4. Human neutrophil chemotaxis to fMLP (10 nM) was inhibited in a dose-dependent manner by ATLa with an IC50 of ∼0.1 nM and a maximal effect at ∼10 nM (data not shown). ATLa was ∼100-fold more potent than the specific LTB4 receptor antagonist (LTB4R-Ant; IC50 = ∼10 nM). In contrast, LTB4R-Ant inhibited neutrophil chemotaxis induced by LTB4 (10 nM) more potently (IC50 = ∼1 nM) than ATLa (IC50 = ∼10 nM). In addition to chemotaxis, ATLa potently inhibited neutrophil transepithelial migration to 10 nM fMLP or 10 nM LTB4 (Fig. 2⇓). Inhibition was dose dependent, with an IC50 of ∼1 nM against fMLP and ∼10 nM against LTB4. As expected, LTB4R-Ant inhibited LTB4-induced transepithelial migration to LTB4 (IC50 = ∼1 nM), but was virtually ineffective on transepithelial migration to fMLP (<20% inhibition at 1 μM). Thus, in addition to potently inhibiting human neutrophil chemotaxis, ATLa potently inhibits neutrophil transmigration through epithelial cell monolayers, a finding consistent with previous in vitro studies (10). The present results correlate with the finding that the receptor ALX-R is expressed on both human neutrophils and human epithelial cells and may mediate LXA4-dependent effects in both cell types (1). Our results also suggest that ATLa might display broader anti-inflammatory potential than LTB4R-Ant, since neutrophil responses to more than one mediator are potently attenuated. ATLa potently inhibits neutrophil transepithelial migration to fMLP and LTB4. Transmigration of human neutrophils across human T-84 epithelial cell monolayers in response to 10 nM fMLP (top panel) or 10 nM LTB4 (bottom panel) was performed as described (see Materials and Methods). The percent inhibition of transmigration by ATLa (•) and an LTB4 receptor antagonist (○) was determined with increasing compound concentration. Data are expressed as the mean ± SEM from three experiments, performed in triplicate. To characterize its anti-inflammatory potential for human skin diseases, ATLa was examined in diverse models of skin inflammation. The models are based on cutaneous reactions to exogenous stimuli that provoke a variety of symptoms, including edema, neutrophil or eosinophil infiltration, and epidermal hyperproliferation. The models encompass features of irritant dermatitis, allergic contact dermatitis, and some aspects of psoriasis and atopic dermatitis. A limitation of the models is their acute character, which does not allow for the assessment of therapeutic administration. Therefore, compounds were tested in a preventive manner by coapplication with the proinflammatory reagents. ATLa was compared with two reference compounds: LTB4R-Ant and the topically active glucocorticoid, MPA. Comparative data for ATLa and LTB4R-Ant in all models are summarized in Table I⇓. Data for MPA are provided in the text and figures. As a direct correlate to antagonism of LTB4 responses in vitro (see above), ATLa was characterized in an LTB4-dependent model. Topical ATLa dose-dependently inhibited edema as well as neutrophil infiltration (Fig. 3⇓). IC50 values were ∼40 μg/cm2, and complete inhibition was achieved at 300 μg/cm2 for both efficacy end points (mean of three independent experiments). The anti-inflammatory effects of ATLa in this model were comparable to the selective LTB4R-Ant, which exhibited IC50 in the range of 20–30 μg/cm2 for all parameters tested. The results in this model are consistent with the potent in vitro functional antagonism of LTB4-stimulated neutrophil responses by both ATLa and LTB4R-Ant. Given their known anti-inflammatory mechanism of action (27), glucocorticoids such as MPA are not active in this direct model of LTB4-induced inflammation and were not tested. ATLa inhibits LTB4/Iloprost-induced inflammation in the ears of mice. LTB4/Iloprost-induced inflammation in mouse ears and measurement of edema, and granulocyte and neutrophil infiltration was measured at 24 h as described in Materials and Methods. Inhibitory effects of ATLa (▪) were compared with those of LTB4-R-Ant (□), both of which were coapplied with LTB4/Iloprost. Results are expressed as the mean ± SEM of eight animals per group. ∗, p < 0.05 vs vehicle control. To examine the influence of ATLa on inflammation mediated by endogenous LTB4 production, efficacy was tested in calcium ionophore-induced inflammation in mice (Table I⇑). ATLa exerted dose-dependent efficacy on all end points in this model (IC50 = <100–200 μg/cm2), with complete inhibition of cell infiltration and ∼70% inhibition of edema at 1000 μg/cm2. ATLa was equipotent to LTB4R-Ant in this model, but was 100- to 1000-fold less potent than MPA (IC50 = 0.1–10 μg/cm2). To demonstrate efficacy across species, ATLa effects were also tested in calcium ionophore-induced inflammation in the ears of guinea pigs (Table I⇑). Inhibitory effects were similar in extent to LTB4R-Ant. The data confirm that ATLa has anti-inflammatory efficacy in two species. Croton oil and mezerein are phorbol ester compounds that elicit an inflammatory reaction triggered by protein kinase C activation. This leads to the release of various proinflammatory mediators, which induce edema, cellular infiltration, and epidermal hyperproliferation. In the model of croton oil-induced inflammation, ATLa and LTB4R-Ant inhibited edema formation and cell infiltration dose-dependently, with IC50 values in the range of 200–600 μg/cm2 (Table I⇑). 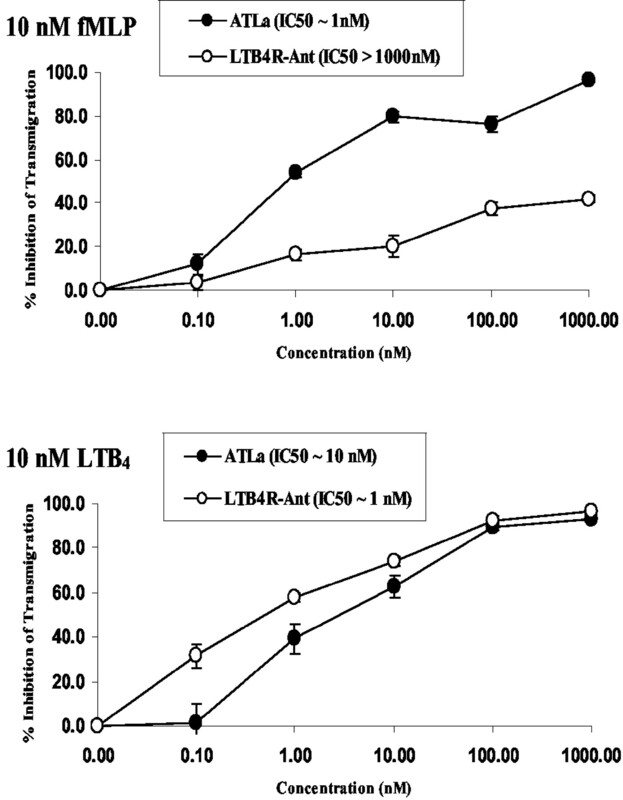 MPA inhibited these parameters with higher potency than both ATLa and LTB4R-Ant (IC50 = <0.2 μg/cm2). In the mezerein-induced inflammation model, IC50 values for edema and cell infiltration measured at 24 h were ∼100–150 μg/cm2 for ATLa (Table I⇑ and Fig. 4⇓). LTB4R-Ant showed similar potency to ATLa, with IC50 values from 100–260 μg/cm2 for these end points. MPA was significantly more potent for all inflammatory parameters (IC50 = <0.1–0.75 μg/cm2). Edema formation was inhibited by 70–80%, and cellular infiltration was completely inhibited at a dose of 1000 μg/cm2 for the eicosanoids and at 10 μg/cm2 for the glucocorticoid. ATLa inhibits mezerein-induced ear inflammation. Mezerein-induced inflammation in mouse ears, edema, and granulocyte and neutrophil infiltration were measured at 24 h as described in Materials and Methods. The anti-inflammatory potency of ATLa (▪) was compared with that of LTB4R-Ant (▦) and to the effects of MPA (□). All compounds were coapplied with mezerein. Results are expressed as the mean ± SEM of 10 animals per group. ∗, p < 0.05 vs vehicle control. Mezerein induces a marked epidermal hyperproliferation: epidermal thickness at 72 h increased ∼5-fold (see Fig. 5⇓A, i, 11 μm; ii, 52 μm; and iv, 10 μm). ATLa caused a potent, dose-dependent inhibition of epidermal hyperproliferation (IC50 = ∼120 μg/cm2). Complete inhibition of hyperproliferation was achieved at the highest dose (1000 μg/cm2; Fig. 5⇓A, iii, 10 μm; and v; and Fig. 5⇓B), with near-complete inhibition observed at 300 μg/cm2. ATLa was 3-fold more potent than LTB4R-Ant (IC50 = ∼400 μg/cm2; Fig. 5⇓B) on this end point. The potency of MPA on epidermal hyperproliferation was not directly compared with ATLa in these experiments, but is in the same same range as its anti-inflammatory effects (data not shown). ATLa inhibits mezerein-induced epidermal hyperproliferation. A, Mezerein was applied, as described in Fig. 4⇑, and epidermal hyperproliferation at 72 h was determined as described in Materials and Methods. Histological sections (×25 magnification) of mouse ear skin show the normal morphology of the vehicle control (i), with marked epidermal and dermal hyperproliferation induced by mezerein (ii), that was completely inhibited by 1000 μg/cm2 ATLa treatment (iii). The higher magnifications (×100) for mezerein (iv) and mezerein plus ATLa (v) treatments demonstrate a decrease in leukocyte infiltration. Big round structures in the dermis represent cross-sections of hair follicles. B, The bar graph shows the percent inhibition of mezerein-induced epidermal hyperproliferation by ATLa (▪) compared with that by LTB4 antagonist LTB4-R-Ant (▦). Compounds were coapplied with mezerein. Results are expressed as the mean ± SEM of animals per group experiments. ∗, p < 0.05 vs vehicle control. TMA stimulates a T cell-mediated inflammatory reaction with a characteristic of DTH. Application of TMA to sensitized animals evokes a mixed cellular infiltrate composed primarily of eosinophils, but with some neutrophils. In this model MPA exerts very potent effects on edema formation and neutrophil infiltration (IC50 = <0.2 μg/cm2), but weaker effects on eosinophil infiltration, as measured with the peroxidase assay for total granulocytes (IC50 = >10 μg/cm2). ATLa inhibited TMA-induced edema formation and cell infiltration, with IC50 values of 320–520 μg/cm2 (Fig. 6⇓). Complete or almost complete inhibition for all parameters was achieved with 1000 μg/cm2. In contrast to the potent and dose-dependent effects of ATLa on eosinophil infiltration (parameter: granulocyte infiltration), the LTB4R-Ant was only able to produce ∼40% inhibition at the lowest dose tested and was completely ineffective at other dosages. The LTB4R-Ant was able to potently inhibit neutrophil infiltration, as measured by the elastase assay. Together these results suggest a differential and superior effectiveness of ATLa compared with LTB4R-Ant with respect to eosinophil infiltration in this allergic DTH reaction. ATLa prevents trimellitic anhydride allergen-induced DTH in mice. Mice were sensitized and then challenged with TMA allergen as described in Materials and Methods. The inhibitory effects of ATLa (▪) were compared with those of LTB4R-Ant (▦) and MPA (□). All compounds were coapplied with TMA during challenge. Results are expressed as the mean ± SEM of 10 animals per group. ∗, p < 0.05 vs vehicle control. Interaction of LXA4 and aspirin-triggered 15-epi-LXA4 with ALX-R has recently emerged as an endogenous signaling pathway for anti-inflammation (1). The field has developed substantially in recent years with the availability of metabolically stable LXA4 analogs, such as ATLa, that facilitate pharmacological experimentation in vitro and in vivo. Despite these advances, the lack of substantial quantities of synthetic lipoxin analogs for detailed evaluation of the potency and efficacy vs benchmark research and clinical standards has not yet been possible. To this end we have synthesized and qualified the lipoxin analog ATLa, which showed intriguing biological properties in earlier studies (1) (see Fig. 1⇑). Our present results establish the following. 1) ATLa potently inhibited neutrophil chemotaxis and transcellular migration, confirming earlier reports (10), and was a broader inhibitor of neutrophil responses than our own potent LTB4 receptor antagonist. 2) Topically applied ATLa dose-dependently inhibited cutaneous inflammation evoked by diverse inflammatory mediators, with complete inhibition of several efficacy end points. 3) ATLa was efficacious in at least two species: mouse and guinea pig. 4) ATLa potency in vivo was at least equivalent to a potent LTB4 receptor antagonist, but considerably less potent than MPA, a clinically used topical glucocorticoid standard. 5) ATLa was shown for the first time to block inflammation-dependent epidermal hyperproliferation and to inhibit a T cell-dependent allergic cutaneous reaction. These findings confirm the actions of ATLa and firmly establish that lipoxin analogs, such as ATLa, are a novel therapeutic class that may be considered for topical treatment of human dermatoses of diverse etiology. ATLa inhibition of neutrophil chemotaxis and transcellular migration to both LTB4 and fMLP in vitro demonstrates a broader influence for ATLa than LTB4R-Ant. In addition to potent LTB4 antagonism in vitro, ATLa exhibited dose-dependent topical efficacy in exogenous LTB4/Iloprost-induced inflammation, with potency equivalent to LTB4-R-Ant. Earlier studies with lipoxin analogs in this model did not establish dose-dependence or potency relative to a direct LTB4 antagonist (6). ATLa potency in this model was quite remarkable given that ATLa is not a direct LTB4 receptor antagonist (IC50 = >10 μM) (28). To explore the broader effects of ATLa, efficacy was investigated in cutaneous reactions triggered by stimuli that induce endogenous release of various inflammatory mediators, including LTB4. Calcium ionophore-induced inflammation is more prominent compared with the LTB4/Iloprost model and is inhibited by LTB4 receptor antagonists (29). As expected, ATLa exhibited dose-dependent topical efficacy with similar potency to LTB4R-Ant, but was less potent than MPA. Importantly, ATLa was shown to inhibit ionophore-induced inflammation in two species: mouse and guinea pig. Croton oil is an irritant that stimulates keratinocytes in vitro and in vivo to release the inflammatory mediators IL-1α, TNF-α, IL-8, and GM-CSF via protein kinase C stimulation (30, 31). As expected, MPA showed anti-inflammatory effects at low doses, whereas ATLa, although as efficacious as MPA, was ∼1000-fold less potent. ATLa efficacy in this model is consistent with lipoxins inhibiting TNF-α-induced epithelial cell IL-8 release (32), and TNF-α-induced neutrophil infiltration and cytokine/chemokine networks in the mouse air pouch (11). Extensive ATLa inhibition of both inflammatory responses (24 h) and epidermal hyperproliferation (72 h) in the mezerein-induced model is particularly noteworthy. This is the first demonstration of an effect of lipoxins on epidermal hyperproliferation. Epidermal hyperproliferation is a frequent finding in some cutaneous disorders and is prominent in psoriasis. The enhanced epidermal growth not only contributes significantly to patient discomfort, but also complicates disease treatment (33, 34). The inhibitory effect on epidermal hyperproliferation might be a direct anti-proliferative effect on keratinocytes, since lipoxins have been shown to antagonize mitogenic effects and to be anti-proliferative (15). Moreover, keratinocyte hyperproliferation appears to be induced by IL-6 and IL-8, both of which are inhibited by lipoxins (1, 32, 33, 35, 36). The strong inhibitory effect of ATLa on epidermal hyperproliferation in combination with its ability to locally inhibit chemokine networks suggest that ATLa could be an effective topical treatment for psoriasis. The occupational allergen TMA induces cutaneous and respiratory allergic reactions in man (37). TMA sensitizes and elicits a DTH reaction in animals, with a mixed Th1 and Th2 character (38). The pronounced efficacy of ATLa on edema formation as well as on neutrophil and eosinophil cell infiltration in this model is the first demonstration that lipoxin analogs can modulate a cutaneous, T cell-dependent allergic response. These results are consistent with earlier studies showing that lipoxin analogs inhibit eosinophil chemotaxis in vitro (39) and eosinophil-driven inflammation in vivo (13, 14). Taken together these findings suggest that ATLa could be explored for topical treatment of dermatoses with a prominent eosinophil component, such as allergic contact dermatitis or atopic dermatitis. Lipoxins are produced in human asthmatics and potently attenuate human monocyte inflammatory responses (40). Moreover, ATLa potently attenuates airway hyper-reactivity and eosinophilia in murine allergic airway inflammation via multipronged suppression of inflammatory mediators (41). Such findings highlight the anti-inflammatory profile of lipoxins as being distinct from LTB4 receptor antagonists. The latter have shown poor efficacy in murine allergic airway inflammation (42) and in human asthma clinical trials (43). In summary, the in vitro and in vivo characterization of ATLa shows a unique anti-inflammatory profile and suggests its utility for the topical treatment of inflammatory reactions in skin. While less potent than the clinically used topical glucocorticoid MPA, topical ATLa showed equivalent efficacy on most end points measured. To date there is no evidence to suggest that lipoxins would be expected to cause skin atrophy or systemic endocrinological side effects, which limit the long term use of several topical steroids. ATLa and related lipoxins analogs might thus offer an alternative approach to chronic treatment of dermatoses or treatment of skin reactions that are steroid resistant. Based on the similarity of cutaneous inflammatory reactions and their underlying mechanisms to inflammation in other organs, the impressive therapeutic effects of topically applied ATLa suggest potential utility in other inflammatory and autoimmune diseases. These include rheumatoid arthritis, multiple sclerosis, inflammatory bowel disease, acute respiratory distress syndrome, and ischemia/reperfusion injury. For these indications, further understanding of the systemic pharmacology, efficacy, and safety profile of ATLa and related lipoxin analogs is required. We thank Eginhard Matzke (Research Business Area Dermatology, Schering AG) for excellent technical assistance. Drs. Nicos A. Petasis and Giovani Bernasconi (Department of Chemistry, University of Southern California) provided synthetic samples of ATLa and general advice on the synthesis and handling of lipoxins. ↵1 Current address: Departamento de Farmacologia, Instituto de Biologia, Universidade do Estado do Rio de Janeiro, Avenue 28 de Setembro 87 fnds, 5o andar, sala 2, Rio de Janeiro RJ 20.560-001, Brazil. ↵3 Abbreviations used in this paper: LXA4, lipoxin A4; ALX-R, LXA4 receptor; AMC, 7-amino-4-methyl-coumarin; ATLa, 15-epi-16-p-fluorophenoxy-lipoxin A4 methyl ester; DTH, delayed-type hypersensitivity; HTAB, hexadecyltrimethylammonium bromide; LTB4, leukotriene B4; LTB4R-Ant, leukotriene B4 receptor antagonist; MPA, methylprednisolone aceponate; TMA, trimellitic anhydride; TMB, tetramethylbenzidine.